JAMES TOBACK'S 1978 Fingers was a bundle of the filmmaker's manias wrapped into onehis sawed-off intellectual's fascination with professional violence (as in Toback's book on Jim Brown or his use of Mike Tyson in Black and White), a director's yen to let actors run as wild as chimps on the warpath (see Toback's collected works) and, lastly, his career-long obsession with the premise of a guy with a being able to talk the babes into bed, no matter how reluctant they are and how outrageous the men's lines are (The Pick-up Artist, Two Girls and a Guy). The Beat That My Heart Skipped, a snub-nosed, urgent Parisian remake by the forceful yet thoughtful Jacques Audiard (Read My Lips), is a big improvement over its source. 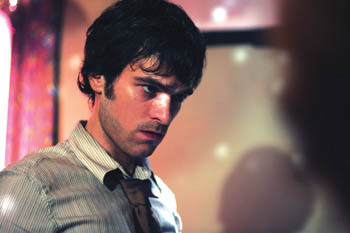 Thomas (Romain Duris, a guttery, compact version of Daniel Day-Lewis) calls himself a "real-estate broker." In fact, he's a leg breaker, who uses vandalism, strong-arming and live rats to scare squatters out of desirable properties. The life he has made for himself is disgusting, but the truth is it wasn't Thomas' doing; he just got pulled into his father's sleazy business. And his dad (the yellow-haired Niels Arestrup, looking as fat and squalid as a blood-engorged tick) is starting to soften and fall apart. He requires more help all the time. At this point, the 28-year-old junior thug retrieves a midlife interest in classical music. (Thomas' own frail dead mom was a noted pianist.) He signs up with a coachthe quietly droll Lihn Dan Phamand begins practicing the piano scales. The music makes him less willing to stay up half the night, prowling the bars and hanging with his friends from the wrecking crew. The split begins in earnest when Thomas is caught covering for a friend's infidelities, by the man's betrayed wife, Aline (Aure Atika). The remake carries over the same problem Pauline Kael identified in the original: telling us of the split between a thug father and a classical musician mother "doesn't dramatize the material, it just explains it." It's suspicious to believe that classical music can civilize a thug (probably not, if the Wagner-loving Hitler, the Caruso-loving Al Capone and the Beethoven-loving Alec the Droog are proper examples). Yet in Audiard's spare but florid film noir, the piano represents the side of life that can't be quantified: anything but the nasty business of scratching a living out of the hide of your fellow man. The Beat That My Heart Skipped (Unrated; 107 min. ), directed by Jacques Audiard, written by Audiard and Tonino Benacquista, photographed by Stéphane Fontaine and starring Romain Duris and Aure Atika, opens Friday at selected theaters.